My family knows this and some of my friends do too…I LOVE cooking on holidays. This trip to San Franscisco was actually so dear hubs could play golf in Pebble Beach, and I was just planning to come along to chill and relax. Of course for me it’s the ultimate relaxation to potter around in kitchens and I was pretty pleased that the Hyatt Carmel Highlands Inn had a pretty good kitchen set up. (It also has a really nice fire place that I have no guts to light a fire in lest I burn the place down). So at the Safeway Supermarket at the bottom of the hill I found something that is completely not available in Singapore – spaghetti squash. This differs from other commoner squashes because it is less starchy and after roasting, the flesh neatly separates out into spaghetti-like strings. I just could not resist this. 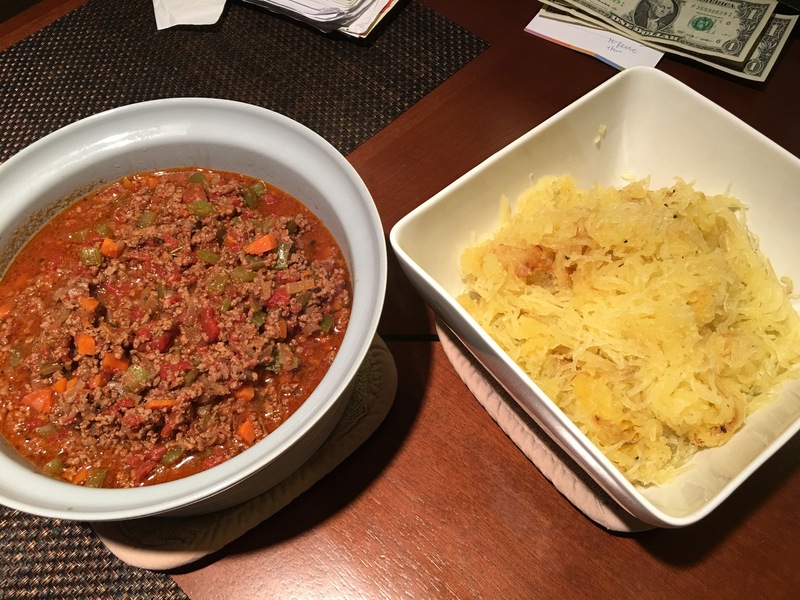 The sauce was a slightly different take from my usual thing, given that I didn’t have wine and balsamic vinegar on hand, but I did pop in some Lily’s dark chocolate to make the meat sauce a little sweeter and richer. Anyway I’m no golfer but given that it’s 8 pm Singapore time (dinner time) and 5 am SF time, I guess this could either be a super hearty breakfast or dinner. It should set the boys up for a good early game of golf and a day of outlet shopping for me! 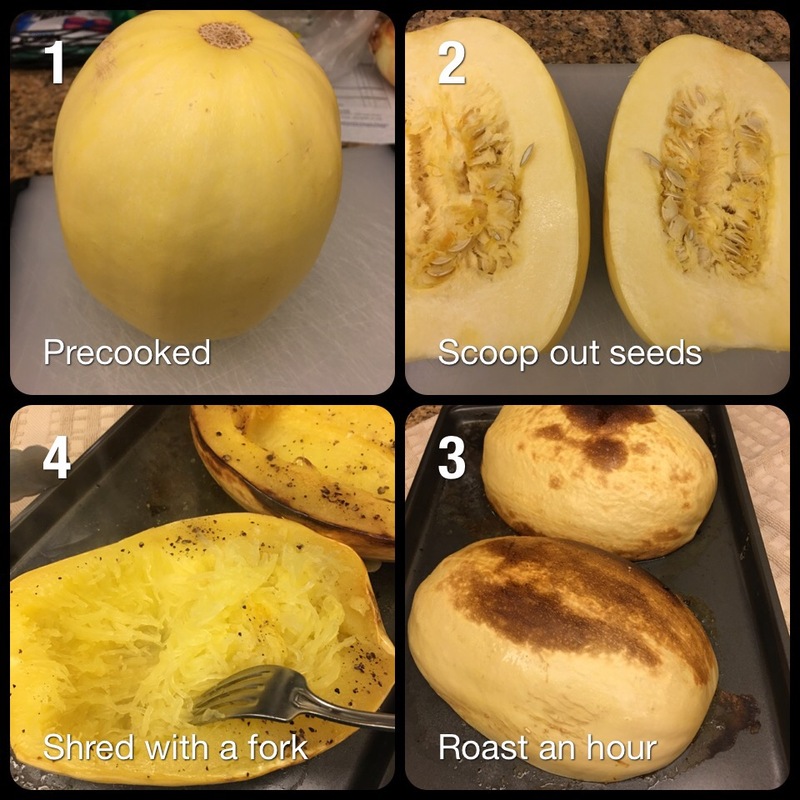 Preheat the oven to 200 deg C. Cut the squash in half and scoop out the seeds with a spoon. Rub on some butter on the cut surfaces and sprinkle the salt and pepper on top. Place the cut sides of the squash cut side down on a baking tray. Put in the oven and bake for 45 minutes. Remove from oven and with a fork, gently shred the flesh of the squash. This comes away easily in fine shreds. Place in a bowl and set aside. Heat up the butter in a large pot. Sauté the onions, carrots, celery and green peppers for about 10 minutes till caramelized. Add in the butter and brown the meat. Add the 2 cans of diced tomatoes in their juices, then add the salt, pepper, cayenne pepper and dried herbs and stir well. Scoop up about 1/2 cup of the simmering liquid and dissolve the bouillon paste in it, then return to the pot. Add the chocolate and mix through well. Simmer for another 1/2 hour till the vegetables are tender. 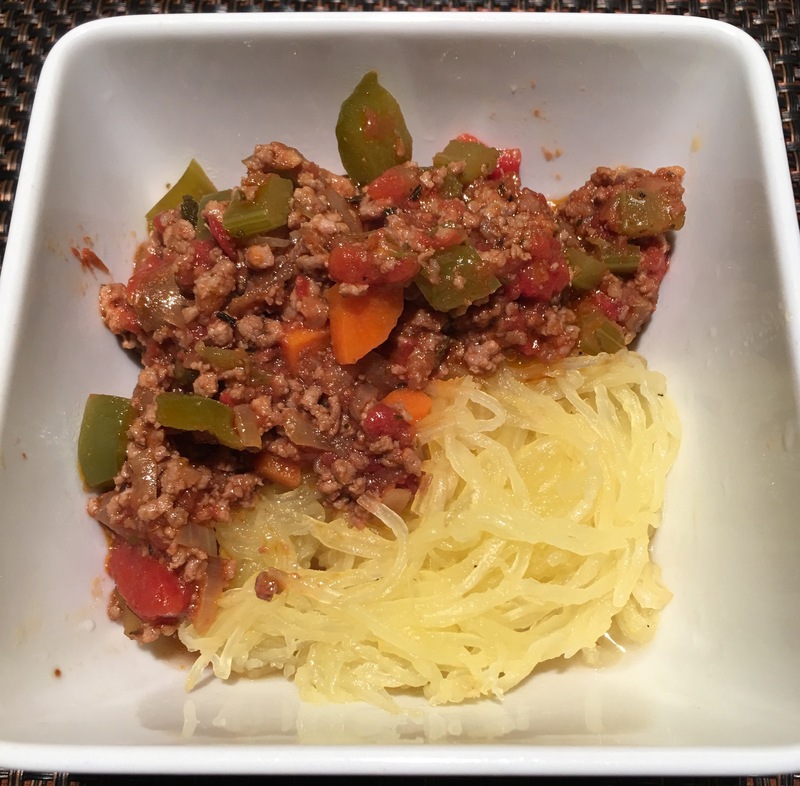 Serve hot on top of the spaghetti squash.